Sunrisers Hyderabad (SRH) produced a solid batting performance to beat Kings XI Punjab (KXIP) by seven wickets and virtually secure their place in the knock-out stage of the ongoing Indian Premier League (IPL). 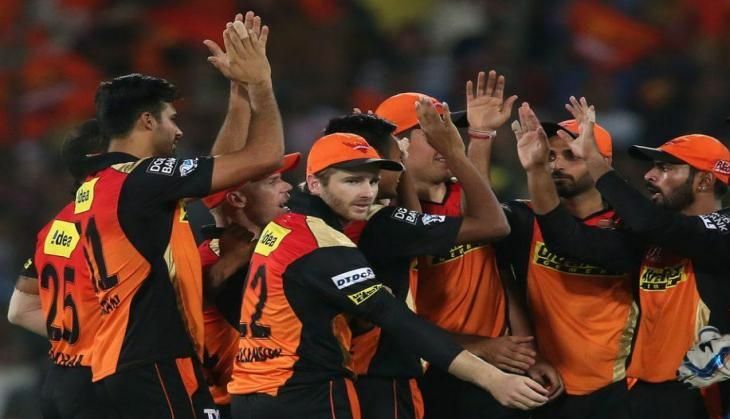 Chasing a challenging 180 for win, skipper David Warner led from the front scoring 52 off 41 balls while Yuvraj Singh made unbeaten 42 off just 24 deliveries as Sunrisers comfortably overwhelmed the target, reaching 183 for three in 19.4 overs. With this win, Sunrisers are all but through to the knockouts and are currently atop the standings with 16 points from 12 games. The loss means Kings XI became the second team after Rising Pune Supergiants to be eliminated. Earlier, Hashim Amla smashed a quickfire 96 off just 56 deliveries to help Kings XI post 179 for four after Murali Vijay won the toss and elected to bat. But Sunrisers looked in total control throughout the chase with Warner and Shikhar Dhawan (25 off 22 balls) putting on 68 runs in eight overs for the opening stand. A Mohit Sharma direct throw from long-on cut short the opening partnership with Dhawan falling short off the crease by a margin at the non-striker's end. But Warner, who brought up his 50 in 38 balls, continued to build up the innings along with Deepak Hooda, who made 34 off 22 deliveries with the help of three fours and one six. Left-arm spinner Axar Patel gave Kings XI the crucial breakthrough of Warner in the 13th over when the Australian left-hander was dismissed hit wicket as he went far too deep inside his crease while trying to play a shot. At 97/2 and needing 83 off 47 balls, Yuvraj joined Hooda at the crease. With Sunrisers needing 50 runs in the last five overs, Hooda smashed Marcus Stoinis for two boundaries to bring down the equation. However, Hooda departed in a bid to accelerate when he lobbed a Sandeep Sharma delivery to David Miller at deep midwicket. But that was all Kings XI bowlers could manage as from there on it was all Yuvraj show. In the company of Ben Cutting (11-ball 18*), Yuvraj shared 41 runs off the final four overs to gude Sunrisers home.